Researchers at the University of York and the British Museum have discovered traces of opiates preserved inside a distinctive vessel dating back to the Late Bronze Age. 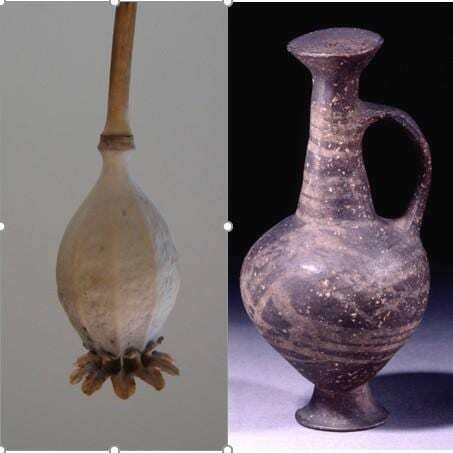 Vessels of this type, known as 'base-ring juglets', have long been thought to have links with opium use because when inverted they resemble the seed head of the opium poppy; they are known to have been widely traded in the eastern Mediterranean ca. 1650 – 1350BC. Researchers used a range of analytical techniques to study a particular juglet housed in the British Museum, which is a sealed vessel, allowing the contents inside to be preserved. This meant that there was a rare opportunity for scientists to investigate what components might have survived. Initial analysis by scientists at the British Museum showed that the juglet residue was mostly composed of a plant oil but hinted at the presence of opium alkaloids, a group of organic compounds derived from the opium poppy, and that are known to have significant psychological effects on the human body. To conclusively detect the alkaloids and demonstrate the presence of opiates in the oil-based residue of the vessel, however, a new analytical technique was needed. Using instruments in the Centre of Excellence in Mass Spectrometry at the University of York, Dr Rachel Smith developed the new analytical method as part of her PhD at the University's Department of Chemistry. Dr Smith said: "The particular opiate alkaloids we detected are ones we have shown to be the most resistant to degradation, which makes them better targets in ancient residues than more well-known opiates such as morphine. "We found the alkaloids in degraded plant oil, so the question as to how opium would have been used in this juglet still remains. Could it have been one ingredient amongst others in an oil-based mixture, or could the juglet have been re-used for oil after the opium or something else entirely?" In the past, it has been argued that these juglets could have been used to hold poppy seed oil, containing traces of opium, used for anointing or in a perfume. In this theory, the opium effects may have held symbolic significance. Professor Jane Thomas-Oates, Chair of Analytical Science in the Department of Chemistry, and supervisor of the study at the University of York, said: "The juglet is significant in revealing important details about trade and the culture of the period, so it was important to us to try and progress the debate about what it might have been used for. "We were able to establish a rigorous method for detecting opiates in this kind of residue, but the next analytical challenge is to see if we can succeed with less well-preserved residues." This is the first time that reliable chemical evidence has been produced to link the opium poppy with a base-ring juglet, despite many previous attempts by researchers over the years. Dr Rebecca Stacey, Senior Scientist in the Department of Scientific Research at the British Museum, said: "It is important to remember that this is just one vessel, so the result raises lots of questions about the contents of the juglet and its purpose. The presence of the alkaloids here is unequivocal and lends a new perspective to the debate about their significance." The research is published in the Royal Society of Chemistry's journal Analyst and funded by the National Environmental Research Council (NERC).